Each person and each cancer is unique, and the goal of precision medicine is to uncover this individuality. For colorectal cancer (CRC), we have discovered a few important pieces of the puzzle, but the entire picture is incomplete. There is an urgent need to discover more specific predictive markers of CRC that can improve outcomes, and for an approach that delivers every piece of the puzzle at once. Comprehensive genomic profiling (CGP) may be part of the solution. About one in 20 Americans will develop CRC in their lifetime, and it is the second leading cause of cancer-related deaths in men, and the third leading cause in women.1 Obtaining a complete view of the diverse drivers of the disease will be essential to reducing its impact. Use of therapeutic antibodies that inhibit EGFR is a standard of care for CRC, but they don’t work for the majority of patients. About 40% of CRCs have mutations in the KRAS or NRAS genes that make EGFR inhibitors ineffective, and alterations in additional genes that may predict lack of response to EGFR inhibitors continue to be elucidated.3,7 Clearly, a snapshot of a single genomic alteration is not sufficient to make a truly informed decision for CRC. Another major way of guiding treatment in CRC is using microsatellite instability (MSI). MSI is related to defects in the ability of cells to repair mistakes in their DNA. Tumors that have high numbers of these defects are called MSI-high, and about 15% of CRC are known to be MSI-high.4 Historically, the MSI status of CRC has helped determine the likelihood of response to chemotherapies, and MSI is still tested for as a standard classifier of CRC. In recent years, we’ve learned that MSI-high status can help predict responses to a new class of medicines that are revolutionizing treatments for metastatic CRC – checkpoint inhibitor cancer immunotherapies. But, like hotspot testing, MSI status alone cannot provide all the relevant information. Researchers at the City of Hope Comprehensive Cancer Center recently published a case study in which very high tumor mutational burden (TMB), identified through FoundationOne® CGP, and likely the result of an identified POLE mutation, predicted a response to cancer immunotherapy in a tumor that was not MSI-high. Due to the complexity of CRC, a comprehensive genomic approach that identifies diverse drivers using a single assay may best direct the course of action. CGP evaluates the coding regions of hundreds of cancer genes simultaneously. Not only can this technique reveal known drivers of cancer, but in many cases CGP has revealed novel targetable alterations not detected by other techniques. CGP is also advancing the field of cancer immunotherapy. 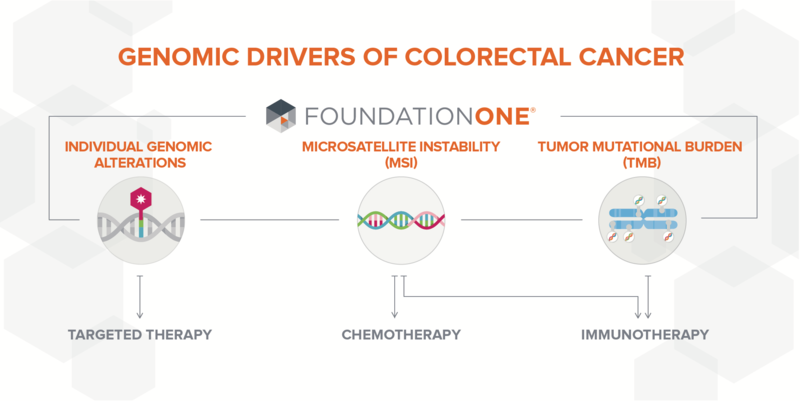 Data presented at the 2016 American Society of Clinical Oncology (ASCO) meeting showed that utilizing TMB – a quantitative measure of the total number of mutations in a tumor – could significantly increase the number of CRC patients who may benefit from checkpoint inhibitor therapies compared to MSI status alone.9 FoundationOne is the only CGP assay that, with one sample, can simultaneously give a clinician TMB measurement, MSI status, and diverse alterations predictive of both response and lack of benefit from targeted therapies, to make the most informed treatment decision. A growing body of data supports the central role of CGP in better understanding CRC genomic drivers. While there is still a great deal to learn about how novel and previously known markers can guide treatment and improve outcomes, we believe it is important that analytically and clinically validated genomic profiling assays become fully integrated into the cancer care treatment model in order to guide a precision medicine approach to clinical care. A step forward would be the inclusion of CGP in future clinical guidelines. Guideline inclusion could expand patient access to appropriate targeted therapies or immunotherapies and help drive forward the research and accumulation of data needed to continue the fight against CRC. The recent draft Medicare coverage policy for CGP in metastatic CRC represents a good first step in advancing cancer care through policy and evidence-based research, but more needs to be done. We’ve seen great strides in CRC thanks to collaboration among industry, academia and advocacy. Further integration of CGP assays into daily practice will add to our collective knowledge and drive forward our quest to change the way CRC is treated. American Cancer Society. Key Statistics for Colorectal Cancer. Available at: https://www.cancer.org/cancer/colon-rectal-cancer/about/key-statistics.html. Last accessed 28 Feb 2017. American Cancer Society. Targeted Therapy Drugs for Colorectal Cancer. Available at: https://www.cancer.org/cancer/colon-rectal-cancer/treating/targeted-therapy.html. Last accessed 28 Feb 2017. Armaghany et al. Genetic alterations in colorectal cancer. Gastrointestinal Cancer Research. 2012;5(1):19-27. Le et al. PD-1 blockade in tumors with mismatch-repair deficiency. The New England Journal of Medicine. 2015;372(26):2509-20. Gong et al. Response to PD-1 blockade in microsatellite stable metastatic colorectal cancer harboring a POLE mutation. Journal of the National Comprehensive Cancer Network. 2017;15(2):142-47. Yakirevich et al. Oncogenic ALK fusion in rare and aggressive subtype of colorectal adenocarcinoma as a potential therapeutic target. Clinical Cancer Research. 2016;22(15):3831-40. George et al. Tumor mutational burden as a potential biomarker for PD1/PD-L1 therapy in colorectal cancer. Poster presented at: American Society of Clinical Oncology Annual Meeting; 2016 June 3-7; Chicago, IL.